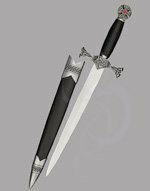 Excalibur was the shimmering blade given to King Arthur by the Lady of the Lake (who I hear was clad in shimmering samite). 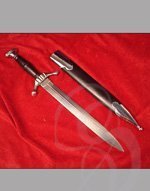 And though Excalibur wasn't engraved, Arthur was a king and his sigil was emblazoned on everything else he owned. 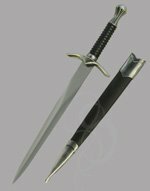 You're not a king, so why not add a touch of free engraving to make this Excalibur truly yours? This beautiful dagger bears the dragon of the Pendragon family on its elaborately carved pommel. It also features Arthur's name, and the word "Excalibur" in a circle around the dragon. 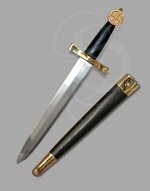 The overall length of this dagger is 14.5 inches with a 9-inch, unsharpened stainless blade. 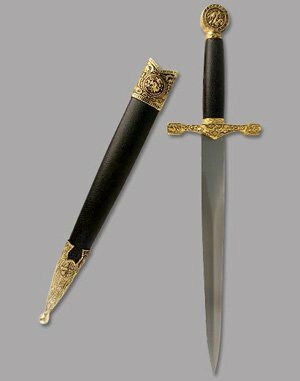 The dagger comes with a sheath that bears throat and tip embellishments of ornately gilded metal. These are extremely popular groomsmen's gifts and wedding gifts.